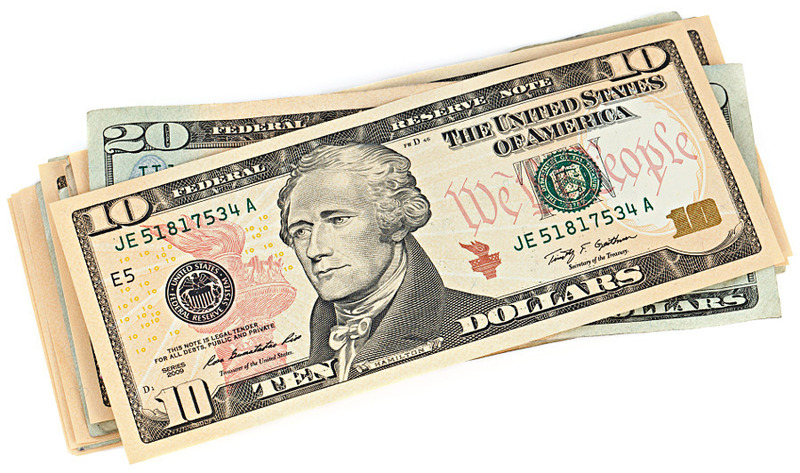 Save 781.50€ on studio equipment!…..What? Recently I talked about the Munsell color system which in brief is a system based on the three qualities of color – hue, value and chroma which helps you in judging color. As an artist you will need to know what colors to mix for your subject and which paints to choose to mix these specific colors. And here comes a color catalogue in handy. While there are some painters who have the Munsell Book of Color* the old masters only had their own tube paints with which they made color charts. My first set of color swatches was the Munsell Student Book* with matte chips of the number 5 hues in all their variations in chroma and value. The book then cost me about 75€ and it has 276 color chips. 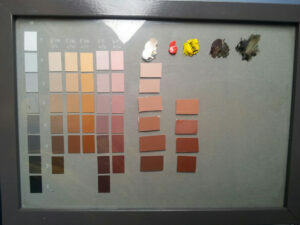 For my flesh tones I put the 5YR and 5R chips under the glass of my low budget glass palette. But 5R is too red for skin tones. What I needed was 7.5R. So I opened the Munsell poster on my computer, placed the 5R from the Student book besides me and tried to interpolate a 7.5R which I then painted on a paper palette to be able to cut out chips after the paint had dried. This approach of trying to mix color coming from a light source isn’t very effective and nearly impossible for a perfect match. Self made 7.5R painted on a paper palette. After the paint had cured I cut out color chips. So this was my flesh tone palette for a while and I started premixing larger amounts to store them in syringes (a little more detail on premixing can be found here). These are all my premixed paints to date. 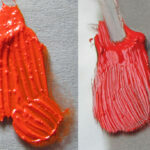 Using premixed paint makes the painting process much easier and faster. 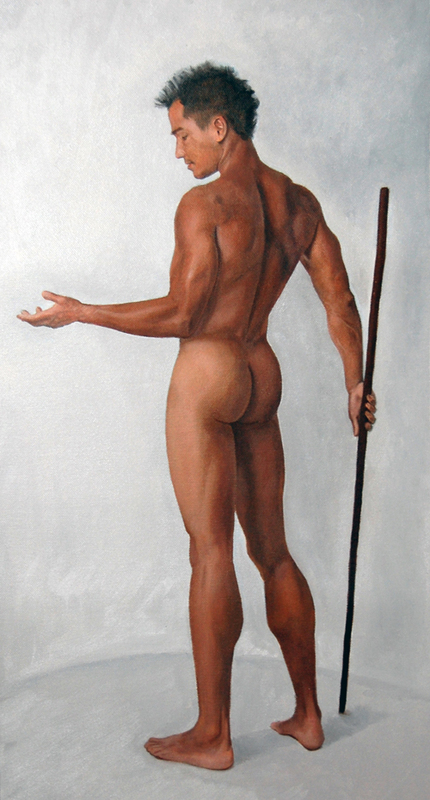 With a photo reference from www.posespace.com (see my blog post about Posespace here) I painted this guy with ease. I then had the luck that someone borrowed me the original 7.5R chips to make my own chips. I bought polystyrene boards, sanded them and painted my premixed colors onto it (with Standoil for a glossy finish). After the paint had cured I cut them out and replaced my Student color chips under my palette (got a new one from IKEA for 6.99€ with a much better and more durable fastening on the rear side). 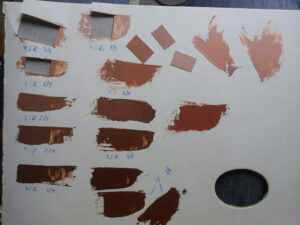 My new palette and Munsell flesh tone chips. To be able to mix all colors in the Munsell Book of Color you would need numerous different types of tube paints which not all are easily accessible. A color catalogue like the Munsell Book of Color will not show you which paints to choose – you have to find out by yourself by mixing them and learning their characteristics. The Munsell Book of Color would cost me 1,029$* (as of March 2019). In it there are 1600 color swatches (~0.64$/chip). And there’s also the possibility to obtain the Munsell Replacement Color chips for $145 for each hue (~0.70$/chip). 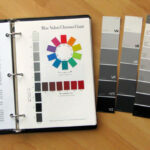 There are propably many color swatches in the Munsell Book of Color that you won’t need except in very special cases. Mark Carder only uses 5 colors to mix all of the colors that he needs for his terrific portraits. I recently stumbled across Thomas Bakers video on making color charts (see the video at the bottom of this post) and he uses 6 basic colors (with few more as convenience colors; they are not absolutely necessary). So I decided to make these color charts too. Which is in total 17.50$! 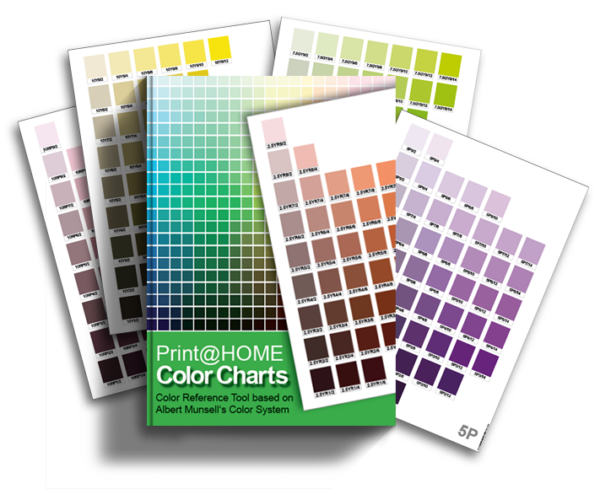 You see: for the fraction of the costs you’ll have a catalogue for all the colors you’ll need and you’ll know how to choose the right colors to mix the desired hues, values and chromas since you make notes on the boards. Depending on the size of your swatches and the value steps you make (I made 7) you can have hundreds of swatches for nearly free. When I have filled all the space on the illustration board with more swatches I’ll have 616 swatches! This is 0.03$/chip and it is unbeatable! So go and do your homework – these charts will accompany you a lifetime. And here’s the video by Thomas Baker. Make sure to watch part 2 and 3 as well. Thanks for that, your link and explanation gave me a much better understanding of the use of colour charts. I am going to create my own now as I can see the sense in them. I’m glad to read that, Peter. Remember to leave enough space for all of your paints and the ones that you’ll buy in the future.